This Michelin-starred fish haven is headed up by chef Jackson Yu, a local restauranteur who also owns several outposts of Live Sushi and Okane, the restaurant next door. 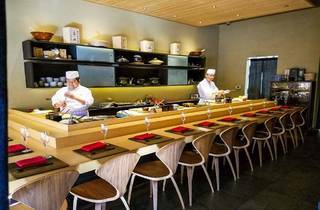 Yu moved to the Bay Area at the age of 18 and has been honing his skills in preparing traditional Edomae-style sushi for two decades. 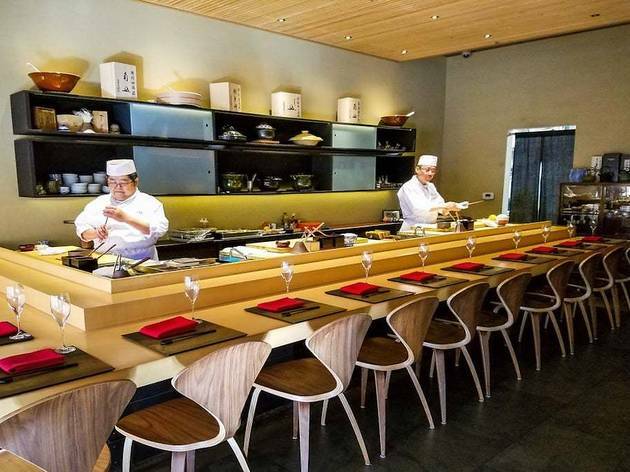 The restaurant offers two fixed-price tasting menus, the Hideaki omakase (two appetizers, one sashimi, 10 pieces of nigiri and one owan for $150) or the Yamato omakase (two appetizers, two sashimi, one yakimono, 12 pieces of nigiri and one owan for $200). Nearly all the fish is flown from Tokyo’s Tsukiji Fish Market—shipments arrive three times a week. (Even the Gen-emon porcelain dishware is imported.) Splurge on the sake pairing, with is served in handcrafted Seikado pewter cups and pitchers.